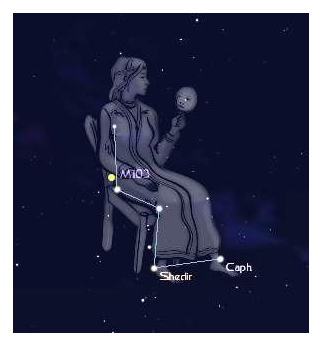 The constellation is named after Cassiopeia, the queen of Aethiopia. Cassiopeia was the wife of Cepheus, King of Aethiopia and mother of Princess Andromeda, Cepheus and Cassiopeia were placed next to each other among the stars, along with Andromeda. She was placed in the sky as a punishment for her boast that Andromeda was more beautiful than the Nereids, she was forced to wheel around the North Celestial Pole on her throne, spending half of her time clinging to it so she does not fall off.